As God represents himself the whole cosmos, this image expresses beautifully his perfect work. 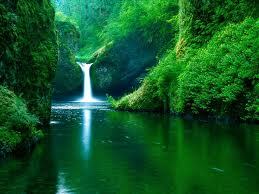 It’s God manifesting his almighty presence through his creation, the natural world in all its fullness. The pure nature composed with the greater number of vegetation displays its inherent colour: green. The chlorophyll forest gives a dominant reflection that spreads throughout the picture, which contrasts to the whiteness of the waterfall, portraying the importance and transcendence of water. The abundance of water in a wonderful lake surrounded by rocks covered with greenery exhibiting the cascade in the backdrop, shows how this element is so sublime and essential for life. The exuberant fall bounded by a rocky verdurous valley is at the pick of the framework reinforcing water’s supremacy. With all those substantial components for survival, it presumes the existence of all possible sources of life. It gets the feeling that fertility is expressed everywhere. The Mother Nature artistically declared, inspires prosperity and richness. Its clean air smells like a fragrance of virgin woods purely natural. The weather is so temperate and delightful that it gives the sense that it is the higher perfect balance of temperature. It’s a majestic landscape, looking like a paradise with its nuance of an idyllic and sensual place. The main impression this ostentatious figure gets is a calm, natural, heavenly and beautiful place for those who search it for contemplation, meditation, and especially for the recognition of life’s value. It also reveals our inner desire for peace and for a place where it’s possible to be in touch with the immaculate nature. It makes an apology to the preservation of the ecosystem, passing the message that everything is integrated and united, and that it is up to us to perpetuate it. This portrait was taken from Google images, it is from an unknown source and its location is unidentified as well.